When students read Pride and Prejudice, they often have difficulty understanding why Mr. Collins will inherit Mr. Bennet’s estate when he has five daughters who might inherit. They also wonder why Elizabeth would be encouraged to marry her cousin, Mr. Collins. That’s just … ew … right? The answer to both of these mysteries is, essentially, money. Austen writes of a very real problem for women in the late 1700’s and early 1800’s. Their only prospects for support were the families of their birth, if they remained single, or their husbands. Women had little opportunity to support themselves, as so many occupations were closed to them; therefore, it was very important for women to marry well. In Austen’s era, the eldest son inherited property through a system known as entailment, which not only prevented the property from being broken up, but also prevented fathers from disinheriting their eldest sons or passing their property on to their daughters. If property is passed through entailment, readers might wonder why Mr. Collins has a different last name from Mr. Bennet. This circumstance may be due to the fact that Mr. Collins (or an ancestor) changed his name because he was designated an heir of another relation. In Emma, Frank is known by the last name Churchill (rather than Weston) upon being adopted by his aunt. He is designated the heir of his aunt and uncle. Jane Austen’s brother Edward changed his name from Austen to Knight when he was named heir of a cousin named “Knight,” and later on her nephew, James Austen, became known as James Austen-Leigh under similar circumstances. Take a look at this explanation of the Collins entailment for more information. Mr. Collins would be an attractive husband for his daughters in Mr. Bennet’s eyes because his estate would still pass on to one of his own children, after a fashion, if Mr. Collins became his son-in-law. At this time, it was not unheard of for women to marry second or even first cousins. In fact, if most of us trace our family trees back to the 1700’s, it is more likely than not that we will find ancestors who married their cousins. It was a really good way of keeping property in the family, and at that time the relations were considered distant enough. Lady Catherine de Bourgh famously insulted Elizabeth because she had plans for her own daughter, Anne, who is Mr. Darcy’s first cousin, to marry Mr. Darcy. 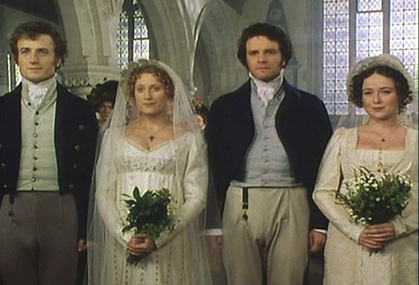 Perhaps our modern sensibilities challenge the notion that marriage between cousins is acceptable, but we also aren’t faced with the same lack of eligible and proper spouses that Austen’s characters often were. At any rate, Mr. Collins is described as a distant relative, and his exact connection to Mr. Bennet is not clear. In Persuasion, Anne Elliot finds herself in an unpleasant situation because she is unmarried. When the Elliot family removes to Bath, Anne is compelled to move as well — despite the fact that Bath is her last choice — because though she is 27, she is unmarried and depends upon her family for support. What’s more, at 27 and 29 respectively, Anne and her sister Elizabeth’s prospects for finding a husband are looking fairly dismal. Contrary to popular belief, women didn’t necessarily marry at 15 or 16, but they did tend to marry in their early 20’s (anthropologically speaking, this is sound, as women are most fertile at that age). Wealthier families could often afford to give their daughters money when they married; thus, it was preferable for men, too, to find a wealthy wife who would bring money into the marriage. In Northanger Abbey, both John and Isabella Thorpe become disenchanted with Catherine and James Morland once they find out marrying into the Morland family won’t bring them the money they were hoping for after seeing the Allens’ wealth and leaping to conclusions. Later, General Tilney throws Catherine out on her ear when he discovers she doesn’t have what he considers enough money to marry his son Henry. Lack of money to bring to a marriage is what makes the Bennet girls and the Dashwood girls in Sense and Sensibility fearful of their prospects of making a good marriage. This post is the fourth in a series on teaching Jane Austen’s novels. I have really enjoyed reading these posts about accessing Austen. Even though I won't be teaching any Austen this year, it helps me think about how to make sure the texts I am teaching are accessible. And I've bookmarked all of these for when I do get the pleasure of teaching Austen. Thank you. Thanks! Reading Jane Austen is a real pleasure, but I have found her difficult to teach because I love her so much and get frustrated when my students don't. Still, I think they appreciate her more if they understand her better. "I think it is a very good thing that our students have difficulty understanding why making a good marriage (by that, I mean marrying a wealthy man or woman) was so important in Austen’s novels. It means that times have changed…"
I thought that this essay was very well done. It was informative without making sweeping judgments. Many today are eager to jump on the "aristocratic society bashing" wagon, without really understanding both the historical context and the realities faced by men and women of the day. It is refreshing to hear an essay describing those times without denouncing them for being "oppressive" and "patriarchal."